General Motors’ U.S. sales rose 13 percent in September on strong crossover demand and a 17 percent rise in retail deliveries. GM sold 251,310 vehicles last month, compared with 223,437 in September 2014. Fleet deliveries dropped 4.5 percent on a 36 percent decline in car shipments to fleet customers. Commercial deliveries rose 10 percent, giving GM its 23rd consecutive monthly increase. Overall, GM said its crossover sales surged 39 percent and truck volume rose 18 percent last month. Car deliveries slipped 12 percent. “Staying focused on core values like initial quality, sales and service satisfaction, cost of ownership, dependability and advanced technology is paying off in higher sales and share, stronger transaction prices and lower incentives,” Kurt McNeil, vice president of U.S. sales operations for GM, said in a statement. Twelve analysts surveyed by Bloomberg had projected an average gain of 9.3 percent for GM, compared with an industrywide forecast of 13 percent. The projected industrywide sales increase is explained in part by Labor Day weekend sales being included in September for the first time since 2012, in addition to higher discounts compared with last year and an improving economy. The decline in GM’s rental volume comes as it plans to boost retail sales and resale values by curbing some fleet business. Rental sales fell 38 percent in August following a 36 percent decline in July. GMC had the strongest monthly performance of any GM brand, gaining 24 percent on strong SUV and crossover sales. GMC Terrain sales rose 32 percent from September 2014, while the Yukon and Yukon XL were up 23 percent and 40 percent. Deliveries of the Sierra pickup advanced 18 percent. September was GMC’s 11th consecutive month of year-over-year sales increases. At Chevrolet, volume jumped 11 percent as the brand’s crossover sales rose 49 percent. 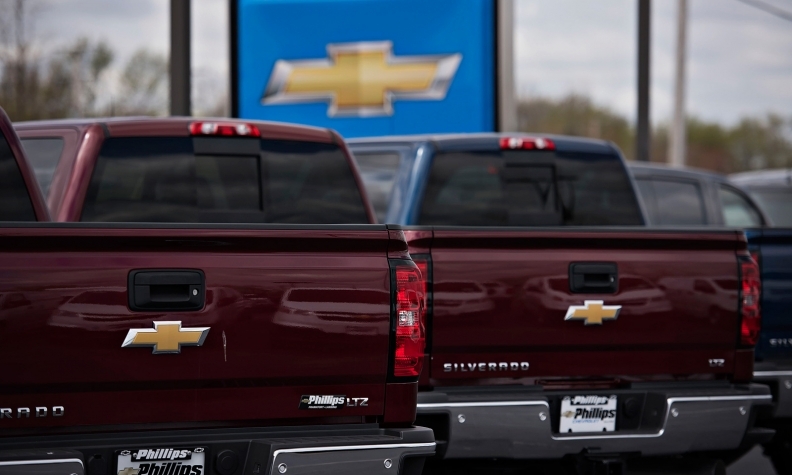 Chevy’s truck sales were up 17 percent -- the 18th consecutive month of year-over-year growth. On the car side, the Camaro, Spark and Malibu posted sales gains of 3, 17 and 12 percent. Buick deliveries, advancing for the third consecutive month, increased 5 percent from a year earlier on strong Encore volume, up 46 percent from September 2014. Regal sales jumped 27 percent, while LaCrosse volume rose 7 percent. Cadillac ended a fourth-month skid with September sales rising 8 percent in part on a 85 percent surge in delieries of the SRX, the brand’s top-selling model. Sales of the ATS edged up 3 percent. GM estimated the industrywide September light-vehicle SAAR will come in at 18.3 million vehicles.